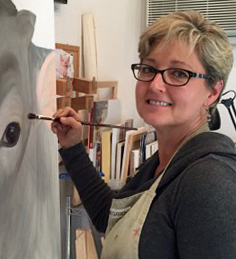 After departing a 20-year corporate career that left little free time, I decided to spend more time on the things that meant something to me – creating art and working with animals. I started volunteering at our local animal shelter (acquiring a few more dogs in the process) and I got serious about oil painting! I wasn’t inspired painting people or landscapes, so I started to focus on animals – and I haven’t looked back. Now I am completely focused on animal art, to help raise money for animal charities/rescue groups. All of my sales proceeds are donated to animal welfare organizations. I am a member of HeARTS Speak, an international group of artists whose mission is to give animals a unified voice through art, the Ashland Gallery Association, Ashland Art Center, and Rogue Women (a local artist group). I also volunteer for the Jackson County Animal Shelter helping with Saturday dog play groups and their rabbit foster program. I am the proud mother of three former shelter dogs and five rescued bunnies, which takes up a large chunk of my non-painting time. My studio – on a clean day!